On June 1, 2007, at 8 a.m., Michael Birkeland blearily opened his eyes to a clear blue sky. He was lying naked in a field in Orem, his clothes scattered around him, his car a few yards away, the engine still running. Birkeland had been at a party until 4 a.m., riding high on cocaine. He had no idea what had transpired in the missing four hours. As he picked up his clothes, he realized it was his young son’s birthday. Such a descent into a narcotics-drenched oblivion has its roots in events five years before, when the stand-up comedian and actor was at the center of a nascent LDS-comedy-film boom, playing in a supporting role an earnest “Peter Priesthood” church member in the first Mormon comedy, The Singles Ward. The low-budget independent film, aimed at Mormons and made by Mormons, launched the careers of actors Kirby Heyborne, Will Swenson and Birkeland, among others. It told the story of a divorced, lapsed Mormon who found success as a stand-up comedian, only to be drawn back to ward life by his attraction to a singles ward’s activity director. While Heyborne and Swenson parlayed that initial success into mainstream careers, Birkeland’s fame was limited to Utah and international Mormon communities through a series of roles in LDS-comedy movies made in the mid-2000s. In a world that’s full of people named Michael, Birkeland says, “There’s only one Michael B, baby,” jerking his upright thumbs at himself. Michael B is the nickname given to him by a friend introducing his stand-up act. His friends call him that or simply “B.” But trying to tell “B’s” story isn’t easy. For a man constantly texting, he can cease communicating for days on end at the drop of a hat, then resurface as if nothing’s happened, leaving some frustrated friends to ponder what they see as a lack of stability. Even the idea of a story on Birkeland makes some of his friends scratch their heads. “You just never know quite what to believe, but it’s always entertaining,” says stand-up comic Dave Nibley, with a laugh. So, ladies and gentlemen, this is Michael B’s story: truth, legend and everything in between. 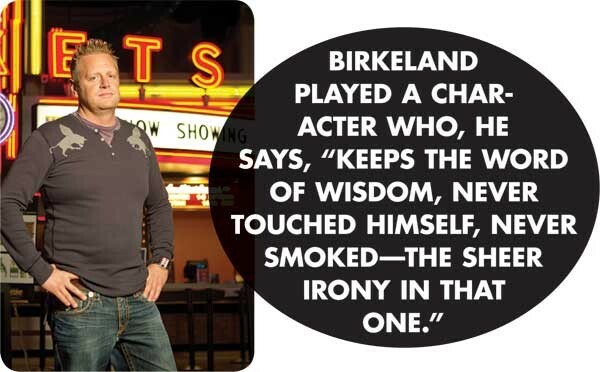 After his cocaine-driven wake-up call, rather than a 12-step program or counseling, Birkeland says he locked himself away in a hotel room for 10 days and quit cold turkey. “I was bleeding out of every hole in my body,” he says. But three months after his 2007 drug-binge black-out, Birkeland hiked up the side of Mount Timpanogos. He had lost “everything spiritual in my life.” He stood on the edge of a cliff, by a small fir, the white waters of a raging river several hundred feet below. “I wasn’t trying to kill myself. I am the least suicidal person you’ll ever meet.” Rather, he says, he wanted answers. He needed to know he mattered, that there was something more to him than just being Michael B. “That’s me on that freaking mountain, by myself. Do I matter?” he asked God. Then he closed his eyes, lifted his arms from his sides and leaned forward into the thin air. Freeze frame that moment of the then 36-year-old blond, spiky-haired man, frozen on the lip of doom, and you see someone caught between mammoth contradictions. A man who yearned for fame, yet loathed the emotional isolation it brought him. A man who daily broke the rules of his faith, yet misses nothing with more passion, besides his children, than the divine guidance his church took away from him with his excommunication. Birkeland’s parents are devout members of the LDS Church and have gone on five missions. “It’s their life,” he says. They raised him, their four other boys and a daughter in Chattanooga, Tenn., hostile territory for Mormons, Birkeland recalls. Beyond the schoolyard slapstick and the struggles of being Mormon in a Baptist-dominated state, what Birkeland shared with very few was that he was systematically abused from ages 7 to 14 by two middle-age women music teachers his parents sent him to for lessons. As an adult, he took anger-management classes, he adds, after violently confronting the abusers at their Chattanooga home. But to his friends, he was the life of the party. They expected him to be a star. “We thought he’d be on Saturday Night Live or making movies in California,” Kammer says.